6th sense and a shunt from stupid cow! K100-forum.com » Off Topic » Humor » 6th sense and a shunt from stupid cow! Just back from a (mostly) pleasant little ride around some of the back ways of Somerset and the Mendip Hills "area of outstanding natural beauty" (according to google maps). 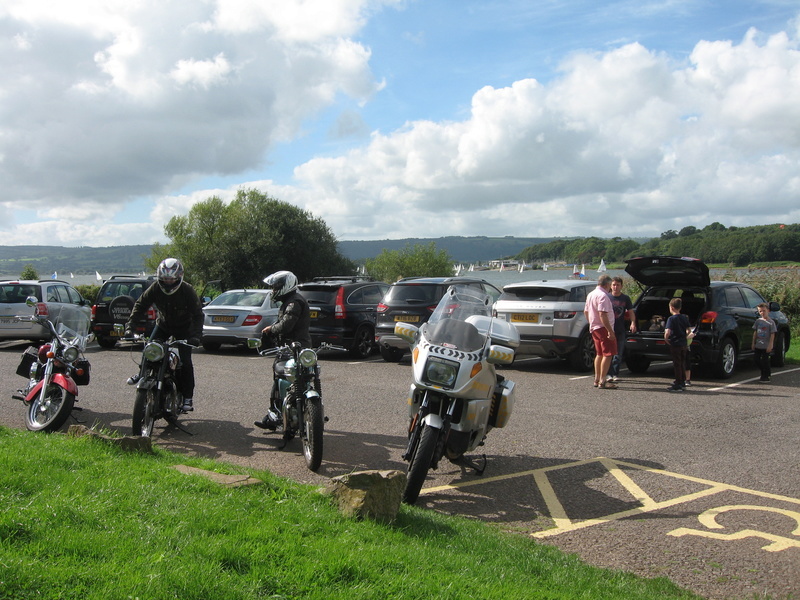 Stopped of for a loffee and sandwich at Chew valley lake and parked up next to an old BSA and ancient Triumph. Due to a slight incline on the car park, I was not happy with the lean angle of Gretel and was worried that, in the event of a side stand failure, she would topple into the (gorgeous) BSA. So I moved her so that she was next to the Triumph (and leaning away from both vintage bikes). I then headed up to the cafe to place my order. Just as I was about to be served, I looked out of the window just in time to see a woman in a SUV reverse straight out of her parking space and smack into Gretel. I watch in horror as Gretel toppled over onto the tarmac on her right side and up against the Triumph. My immediate expletive inside the cafe was not fit for children ears (and I apologised to the family immediately in front of me before running out of the cafe). I fully expected the car to drive off - she didn't - luckily for her. As I stomped towards the bike, I shouted "You stupid cow - why don't you look where you are driving". Given the circumstances, I think my choice of language was very restrained but she didn't like it! "Don't call me a stupid cow in a public place" was her retort. I can only guess that perhaps she likes being called that (or worse) in private? 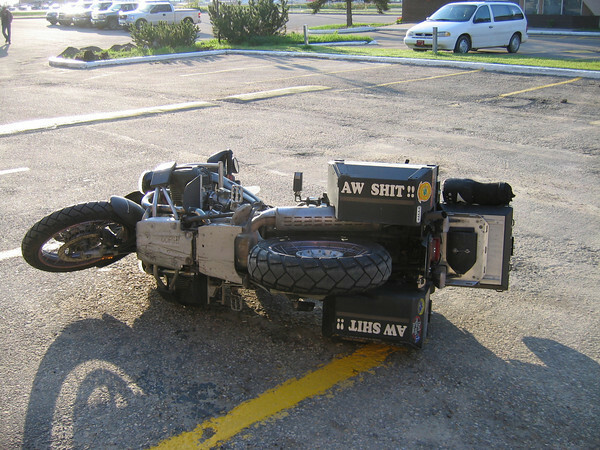 I did apologise - but also pointed out that I don't like people knocking my bike over! Fortunately, my top box only just touched the side panel of the Triumph, and he remained up on his centre stand and the damage to him was minimal (just F'ing annoying). Thank goodness for my 6th sense when parking up - had I parked just a few cm closer to him, I am sure that the domino effect would have taken out all 3 bikes. With some help of a couple of guys, I got Gretel back on her side stand (the difficulty was gaining access on the right side of the bike to pick her up because of the position of the Triumph. A quick inspection revealed that my damage was minimal - the right hand mirror had popped off - but had not broken, so clipped back on again (phew), the right brake lever has bent (she will get the bill for that). Aside some chips and minor scuffs to the paintwork on the right hand lower fairing and right hand pannier, and a scuff mark on the left pannier where she had hit me in the first place, there was no serious damage done. By this time, the other two riders had returned to the scene and I pointed out where my bike had touched the Triumph. He took the details of the "stupid cow" and I am sure she will be getting a call and a small bill from him soon as well. Gretel and friends - fortunately not being too worse off for the experience (the red Honda turned up after the event and parked where I had first parked up). Unfortunately, I didn't think to take a picture while Gretel was having her lie down - I was too worried about the Triumph and wondering what damage had been done to Gretel! So it seems my premonition/6th sense was pretty darn accurate - I wonder though, if I'd ignored it and left my bike where I first parked...would she have still hit me? I think she would have clattered into the Triumph instead - but that could have domino'd into me via the BSA. Whatever, I am very relieved that I left enough of a gap between our bikes that the damage was minimised. As soon as the old bikes had gone, I parked Gretel parallel with the grass to avoid a re-enactment!! After all that excitement, I rode home noting that, with the exception of the bent front brake lever, there appeared to be no further issues with Gretel. To cap it all though, just as I was heading round the roundabout into my local fuel stop near home, I had a dozy driver pull straight out in front of me without looking. I was forced to brake hard and he won the rebuke of the K horns which really scared the bejesus out of him! He pulled into the service station onto the fuel pump ahead of mine and apologised "Sorry - I didn't see you" F'k me! Head light on, yellow, white and red reflective sticks adorning the fairing and panniers, bright fluorescent yellow motorcycle jacket - how can I be that hard to see? Left me quite shaken though! What a great day out nearly spoiled by blind tin boxers.